A UK police force's image of a Ross Geller "lookalike" has drawn thousands of comedy responses. 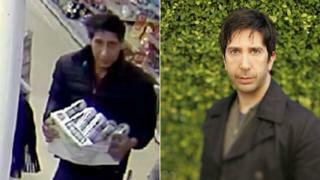 Officers shared the CCTV still of the man, dubbed the "spitting image" of Friends actor David Schwimmer, clutching a crate of beer. Within minutes, fans of the 90s sitcom had bombarded Blackpool Police's Facebook post with jokes inspired by the show. Police later said Schwimmer was not in the UK at the time of the offence. "Thank you to everyone for your speedy responses. We have investigated this matter thoroughly and have confirmed that David Schwimmer was in America on this date," they wrote. As comments on the post descended into something of a Friends quote-fest, a number of the 50,000 users who chipped in referenced the show's chart-topping theme song. "I don't think it's been this guy's day, his week, his month or even his year," wrote Nick Croston, while Olly Byrne quipped: "I'm suprised you've not found him... it's like you're always stuck in second gear." Others, such as Joe Richardson, riffed on some of Ross's most well-known quotes. "Shouldn't he be at work...or is he on a break? ", asked Joe. While Jay Murdoch wrote: "Apparently the police had him cornered then he performed a pivot manoeuvre and escaped." Craig Thompson added: "I saw him behind me in the shop around that time.. just as I was paying for MY SANDWICH." Scottish police also got in on the act, with bobbies in Dumfries and Galloway sharing the post and warning members of the public to "keep away" from the suspect. "He is known to have studied Karate and we believe he has mastered the art of Unagi, the state of total awareness," they wrote. However, some commentators reminded their fellow Friends fans that a real-life crime had been committed. "He's a thief and it's serious," wrote Grace Higham. "But these comments are hilarious." Police appealed for anyone with brand new information about the theft, which took place at Mr Basrai's restaurant on Talbot Road 20 September, to contact them. The suspect is wanted for the alleged theft of a jacket, wallet and mobile from the restaurant. Police released the CCTV image of the suspect buying beer from a shop. It is not known whether the Emmy-nominated star has visited the Lancashire seaside resort, known for its Pleasure Beach and annual illuminations.